I just realised that simply using Prey would probably put you within some walkable distance of your stolen/lost laptop, but if the place was say a shopping centre, then you would be screwed. 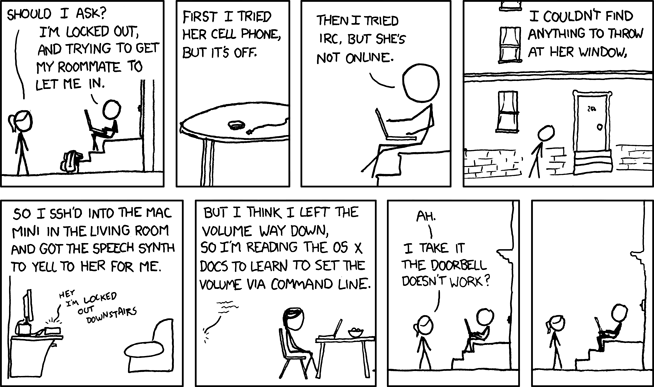 Then I remembered this xkcd comic, and decided to do something similar. SSH into the system using the IP address generated by Prey. Raise the volume to maximum. And then play some music file. Hopefully, the music should be loud enough for you to locate the laptop, even if through people’s reaction to a sudden loud orchestra amongst them. But if you are not satisfied with this, then just use the say to speech synthesise words from the command line after you have raised the volume. Next Post: Au Revoir Lucid Ending!